The function of the rotary tables is related to the collection and the distribution of ready packages. The rotation of the table prevents the accumulation of the packages at one location, which often leads to their damaging and deterioration of their appearance. Adjustable height of the table. Possibility for the regulation of the rotation speed. 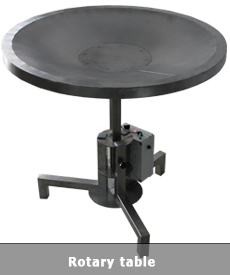 The rotary tables are manufactured from stainless steel and meet the safety requirements for work with food products.